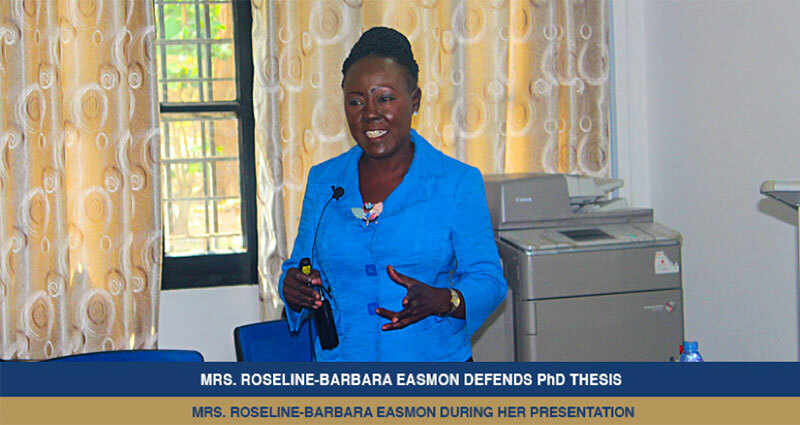 Mrs. Roseline-Barbara Easmon, a PhD student of the Department of Marketing and Entrepreneurship defended her thesis on Thursday 13th December, 2018 at the School of Graduate Studies. Mrs. Easmon presented on the topic, “Export Performance of SMEs In Ghana- The Role of Social Capital and Firm Capabilities”. She was supervised by Dr. Adelaide Kastner, Prof. Charles Blankson and Dr. Mahmoud A. Mahmoud. Her work sought to investigate the sources of social capital and their contribution to superior export performance of SMEs in Ghana, evaluate the impact of marketing and innovation capabilities on the export performance of SMEs in Ghana and examine the mediating role of marketing and innovation capabilities between the social capital and their export performance. She stated that while evidence abounds about the varying contributions of social capital and firm-specific capabilities to the export performance of SMEs, their interaction and contribution to superior export performance within an emerging economy context was less understood. To this effect, she indicated that literature on internationalising SMEs, particularly from an emerging economy context, has focused on internationalisation paths and patterns with capability-related issues being relatively underexplored. Mrs. Easmon further indicated that the review of literature also established the need for an examination of the complex interplays between determinants of export performance and their impact on mediating and moderating effects. Five hypotheses were formulated, illustrated in a conceptual framework that integrated the RBV, DC and SC theories, to examine the association between network-based resources (social capital), market-based capabilities (marketing and innovation) and export performance. Her thesis employed a quantitative approach in gathering data from 297 SMEs within the Ghanaian export sector. A structural equation modelling analysis was undertaken, leading to the confirmation of 4 hypothesised relationships, two of which were mediating. Several conclusions were drawn from the findings, and the findings suggest that social networks may be necessary but not enough to contribute significantly to the success of SME export operations. After a series of questions from examiners, she passed successfully but was asked to make corrections and was admonished not to use the title till it is officially conferred upon her as stipulated by the rules of the PhD programme. Mrs. Roseline-Barbara Easmon expressed her appreciation to Almighty God, her supervisors and colleagues for their support.